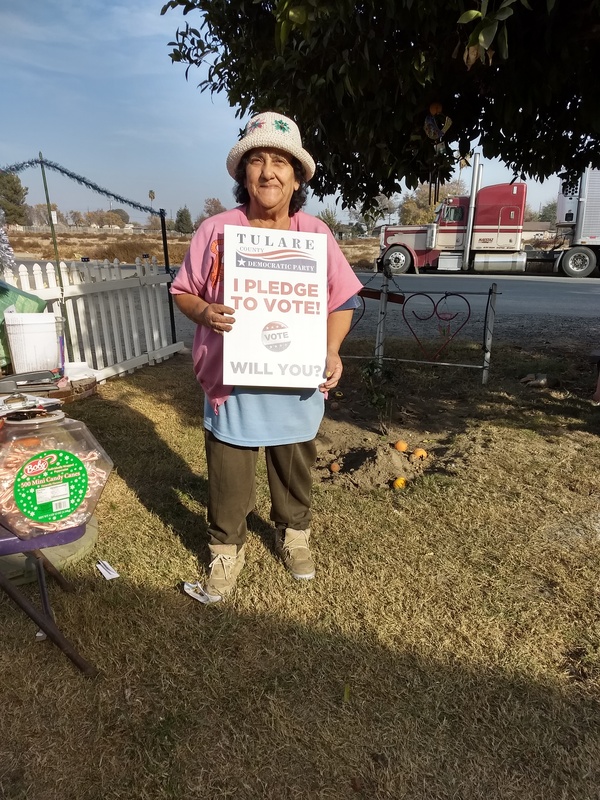 Lorenzo Garcia taking the pledge to vote and challenging his neighbors in Dinuba to do the same. 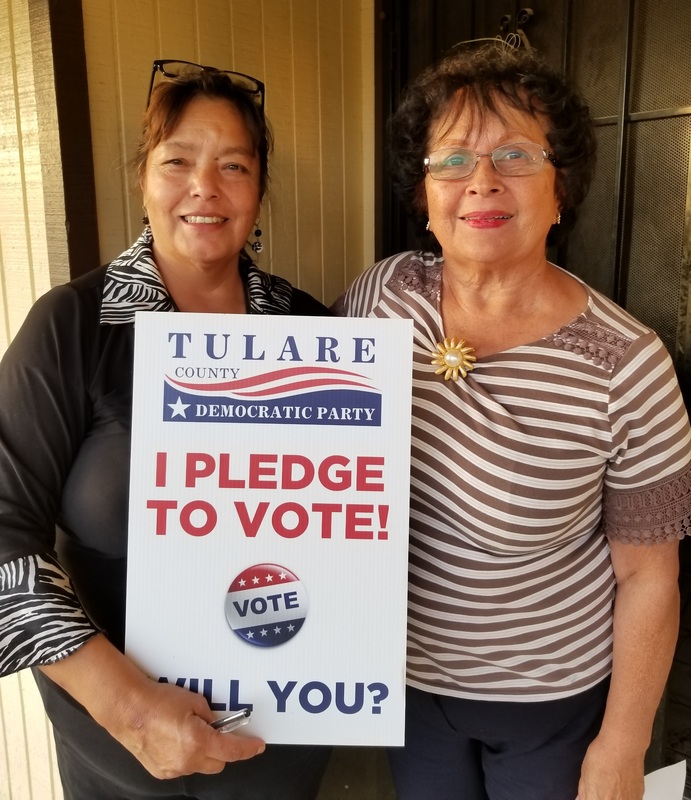 Lucia Flores-Delao (L) with Lucy Perez (R) who is taking the pledge to vote and challenging her neighbors in Dinuba to do the same. 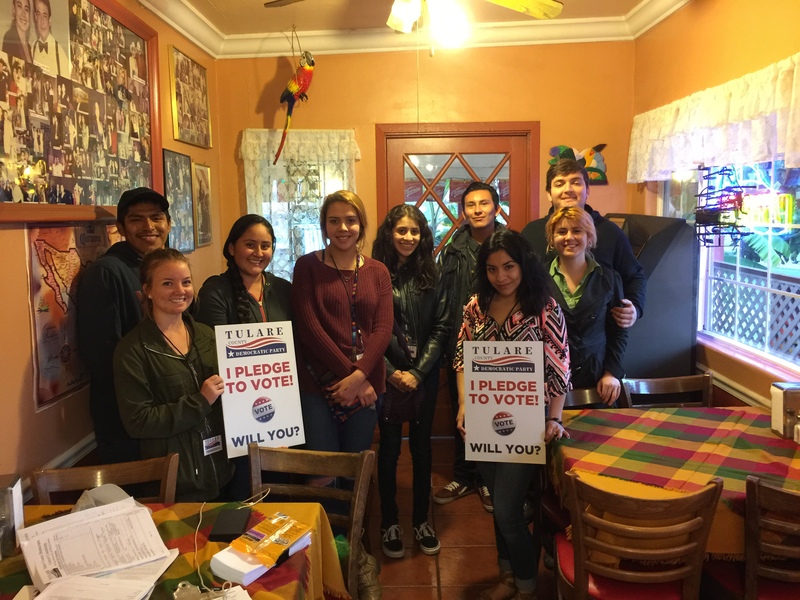 Estalla Bravo taking the pledge to vote and challenging her neighbors in Tipton to do the same. 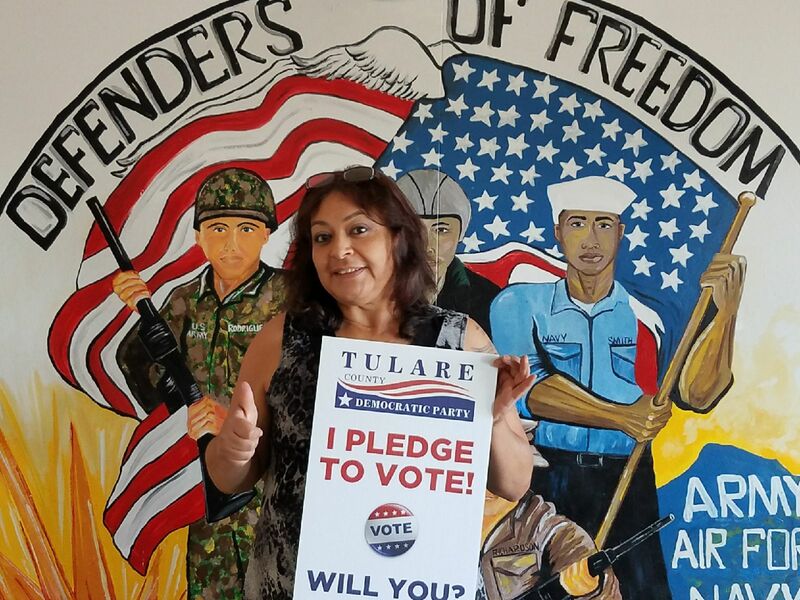 Melba Espino from Orosi challenges you to register and vote. Earl Cruser, Democratic Party Neighborhood Organizer challenges you to register and vote. 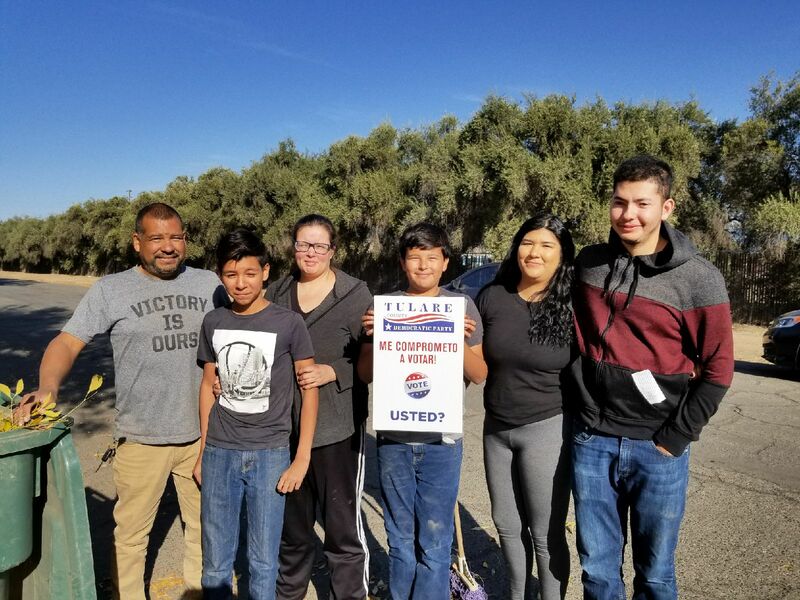 The Gonzalez family in Lindsay challenges you to register and vote. 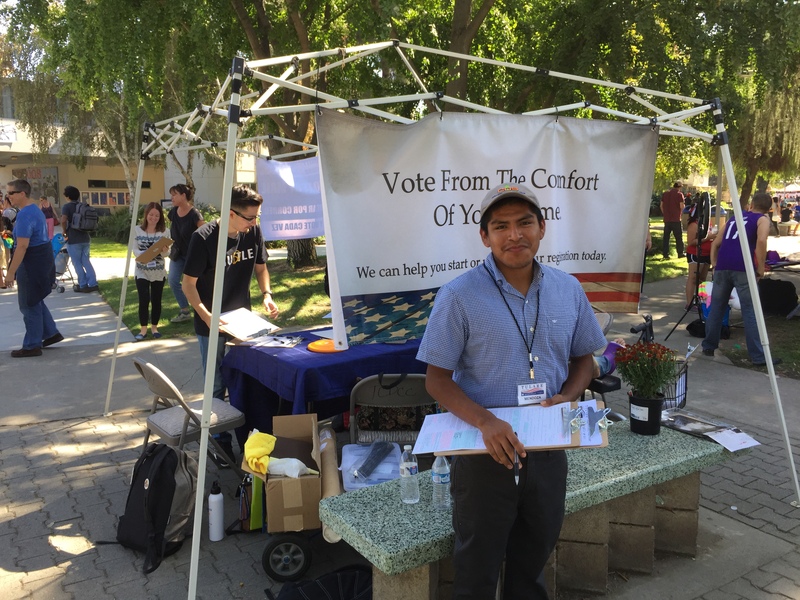 Javier Contreras challenges you to register and vote. 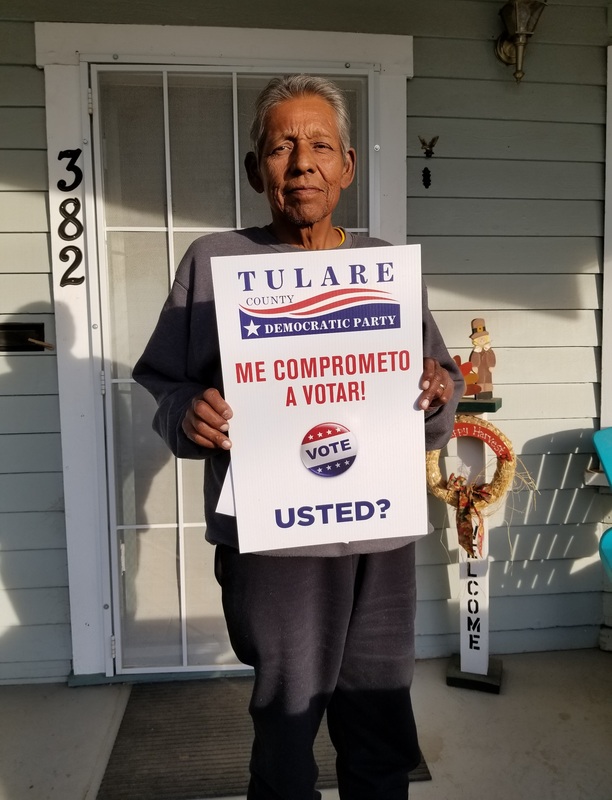 Tulare County Democrats need you to become a Neighborhood organizer. Learn to identify, organize, and mobilize voters in your neighborhood. Volunteer now. 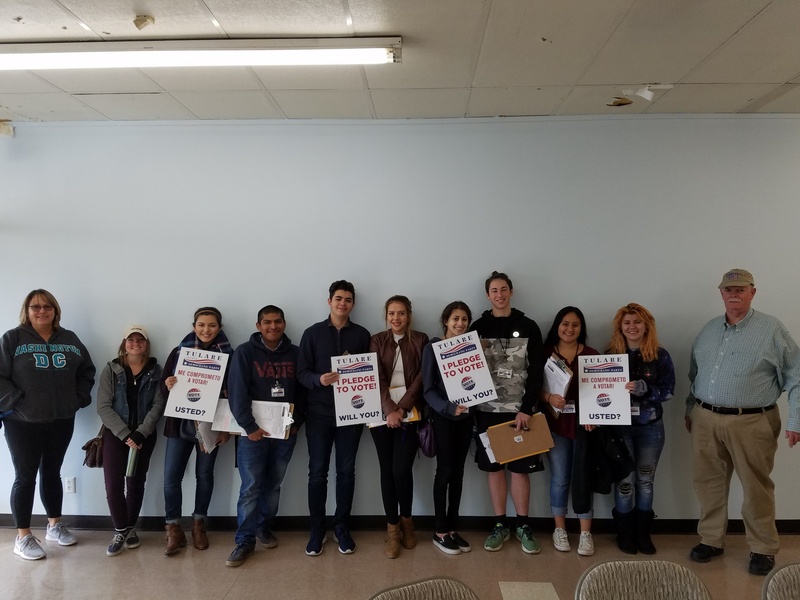 Becoming a Tulare County Neighborhood organizer is the single most important thing you can do to help turn this county blue.! The precinct is the smallest unit of electoral geography. Your neighborhood is part of a precinct. 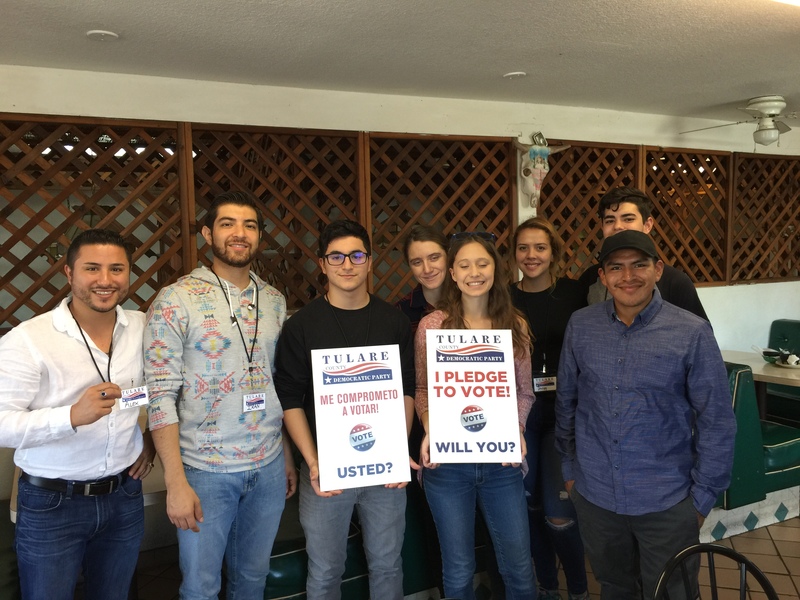 As a Neighborhood organizer, your task will be to personally contact your Democratic neighbors in your immediate neighborhood (20 to 30 homes) to encourage them to vote and perhaps volunteer. We’ll provide you with all the tools, information, training, and support you’ll need. We need YOU to make this neighborhood organization program a success . We need YOUR support to turn Tulare County Blue. We need YOU to help take back our government and repair America’s standing in the world. 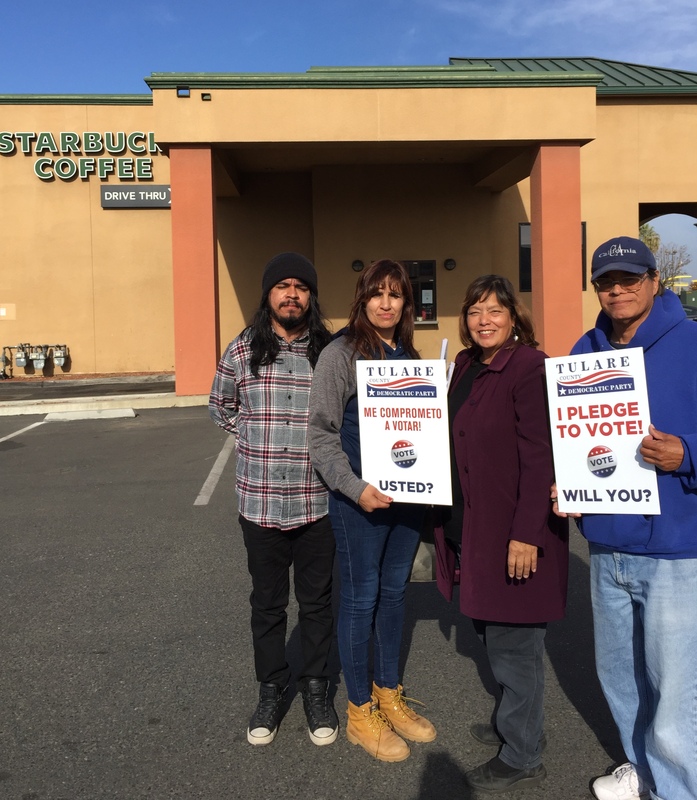 We need YOU to win in Tulare County. 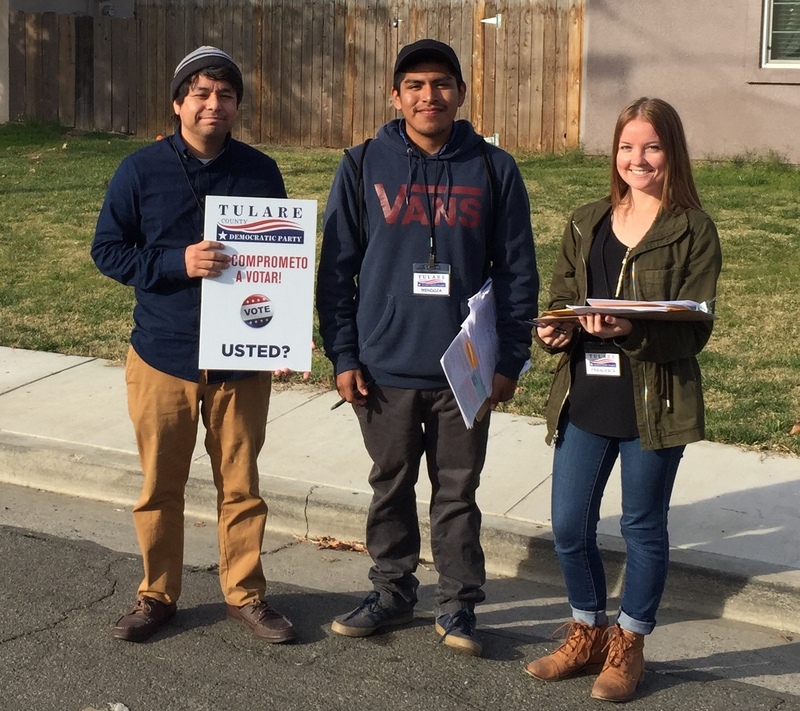 This can’t wait — get fired up, and apply now to become a Tulare County Neighborhood organizer. What is a Precinct?A precinct is the smallest unit of electoral geography. In a heavily democratic state like California, a typical precinct contains roughly 20 to 300 registered Democrats. Generally, your precinct is made up of your home and several surrounding blocks. Your neighborhood is a smaller part of the precinct. Those registered Democrats are your neighbors. We want you to talk to the people in your neighborhood. What is a Neighborhood organizer? Neighborhood organizers are the face of the local Democratic Party for their immediate community. 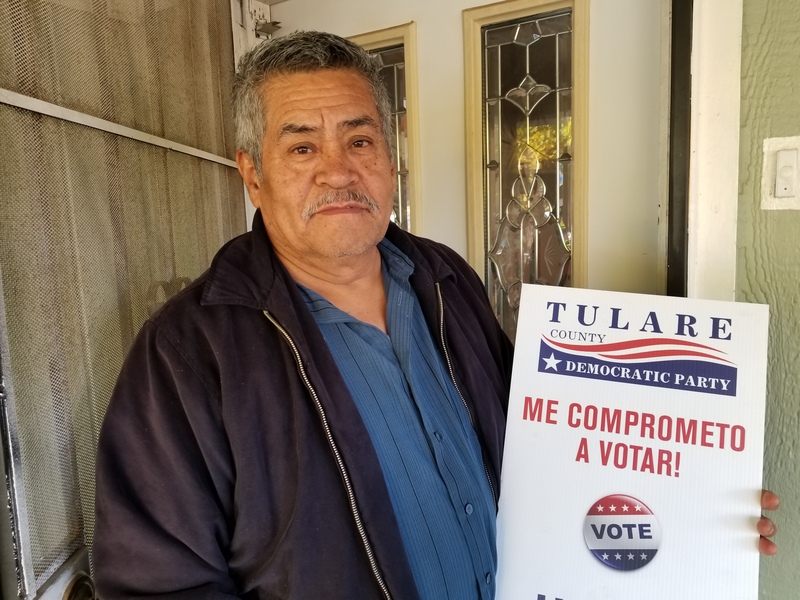 Using tools and support provided by the Tulare County Democratic Central Committee (TCDCC) Neighborhood organizers will contact their Democratic neighbors, and encourage those neighbors to vote by mail, reregister to vote by mail, or in person on election day. What will I need to do as a Neighborhood organizer? Identify Supporters: elections are won by the candidate who is most successful at getting their supporters to the polls. In order to do that, you have to know who your supporters are. The first step for a Neighborhood organizer is to identify Democratic Voters in their precinct. The TCDCC will provide you with a list of Democrats in your precinct as well as material to give to your neighbors. Reach Out to Voters: Many voters in your neighborhood will not have heard from the local Democratic Party when you contact them. As a Neighborhood organizer, you will be asked to speak with Democratic voters, and share your personal reasons for being involved on a local level. It’s easy! Just be honest and talk about the importance of voting and being regular voter. Emphasize that politics is about community. Your vote on local issues is very important. Many local elections are won or lost by a small number of votes. Not voting is the same as voting for the Republicans. If you don’t vote the other persons vote carries more weight. You don’t need to debate policy, or discuss the day’s headlines. You have a very personal reason for investing your time and energy in this campaign—that is the most compelling story you can tell. Visibility: When an undecided voter drives down the streets in your neighborhood, they should know that many of their neighbors support Democratic Candidates. For some, it could be the first step towards getting to know these candidates. 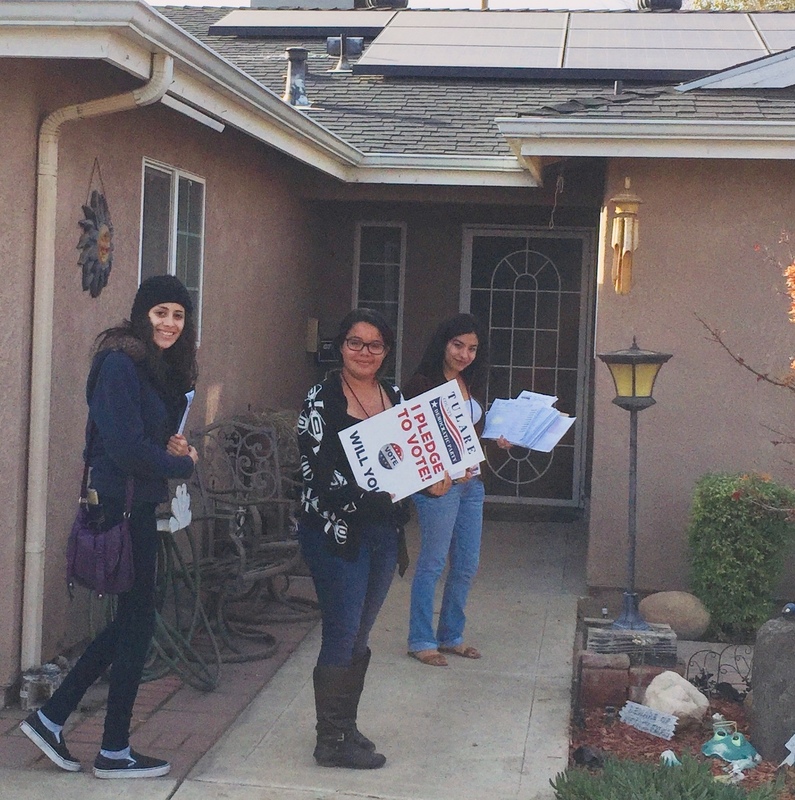 As you are identifying supporters, you will also be providing them with information about the party and issues, during elections you will be providing signs for their windows and lawns, bumper stickers, etc. 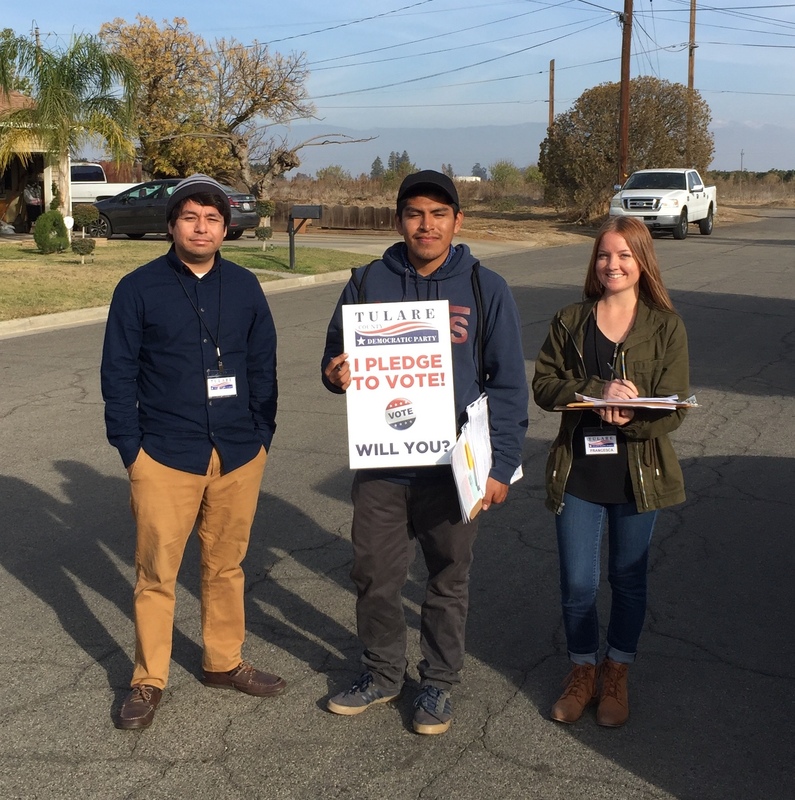 Get Out the Vote (GOTV): As Election Day approaches and absentee ballots are delivered by mail, the Neighborhood organizer’s task shifts from identifying supporters to making sure those supporters vote. By this time, you will have contacted all of the Democrats in your neighborhood. (Most likely, several of them will already have offered to help! Have them contact the TCDCC office for training. ) Your goal is for you and other volunteers simply to stay in touch with every Democrat in your neighborhood and confirm that they do indeed cast their vote before the polls close on Election Day. How do Neighborhood organizers do all of this? Tools Neighborhood organizers program is centered around a simple Neighborhood walk list. The walk list contains the names address and and sometimes phone numbers of voters in your neighborhood, You will record the results of phone calls and face to face contact, and track progress towards towards your goal of contacting all of your neighbors. The mobile app is an easy way to turn your smart phone into an organizing tool. Phone Calls: One of the most efficient ways to contact voters is by telephone. Texting and talking are an easy way to keep in touch with Democrats in your precinct. Most likely, many of the Democrats you speak to will offer to help—take them up on it! Finding others to help will spread out the workload and insure that more voters are contacted regularly Have them contact the TCDCC office for training..
Canvassing: While phone calls are the most efficient, speaking with your neighbors face-to-face is the best way to build support in your precinct. It’s a “higher quality” way to contact voters. Begin canvassing, or walking your neighborhood and knocking on doors and follow up with phone contacts or inperson visits. Able to commit roughly 2 to 3 hours per month to organize your neighborhood work. Comfortable speaking with your neighbors about Democratic candidates and issues. Comfortable using the Internet and basic computer applications, or be willing to team-up with someone who is. 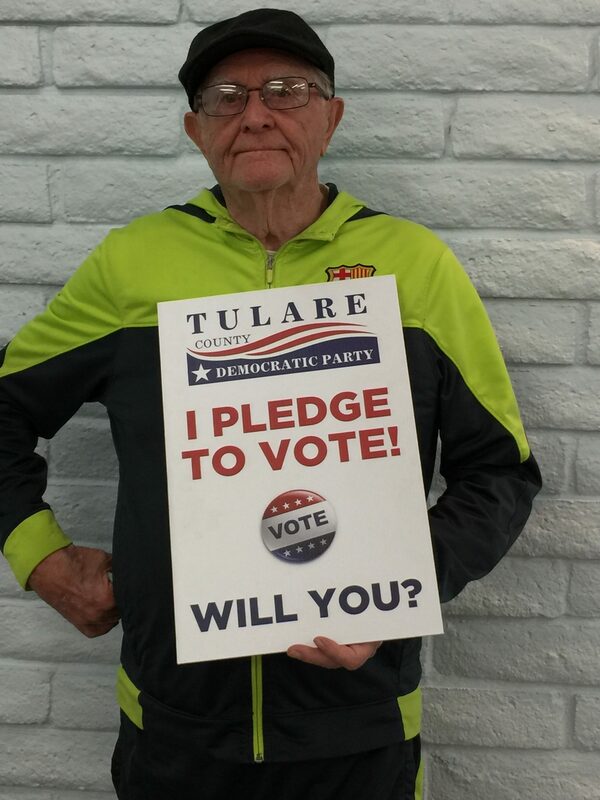 NOW is the time to begin the process of building a strong Democratic Party in Tulare County:. We want to have a fully functional neighborhood organizing team in place by the elections. We need your help now to build a strong party. We need your help to mobilize voters and win elections.